Are you celebrating Halloween tonight? What are you dressing up as? This dress has been sat in my "to feature" pile for ages so I am glad to finally be able to share it with you. 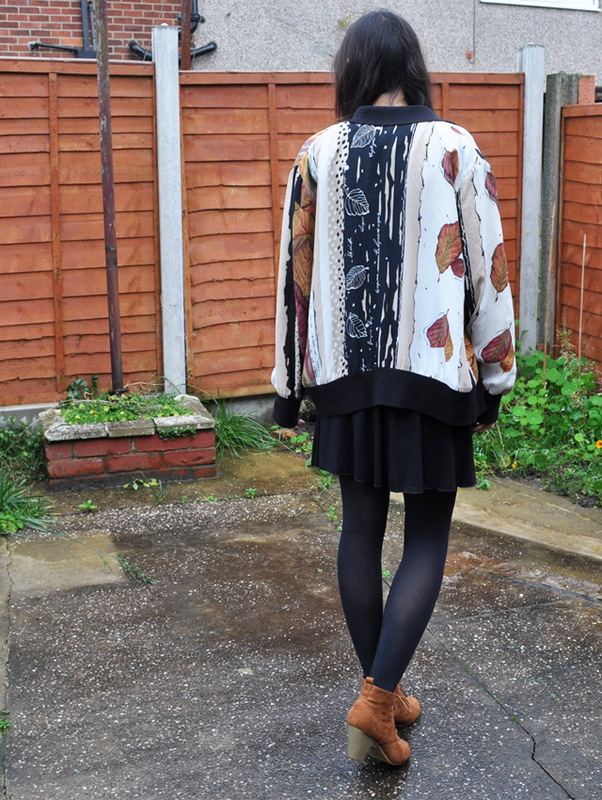 It's the perfect dress for just throwing on and layering up as it's so simple and comfortable, and the rust colour is perfect for Autumn- I love pairing it with this jacket as the colours on the leaves compliment it so well! However, it is a dipped hem dress and the front falls pretty short (even on my tiny 5ft 4 frame! 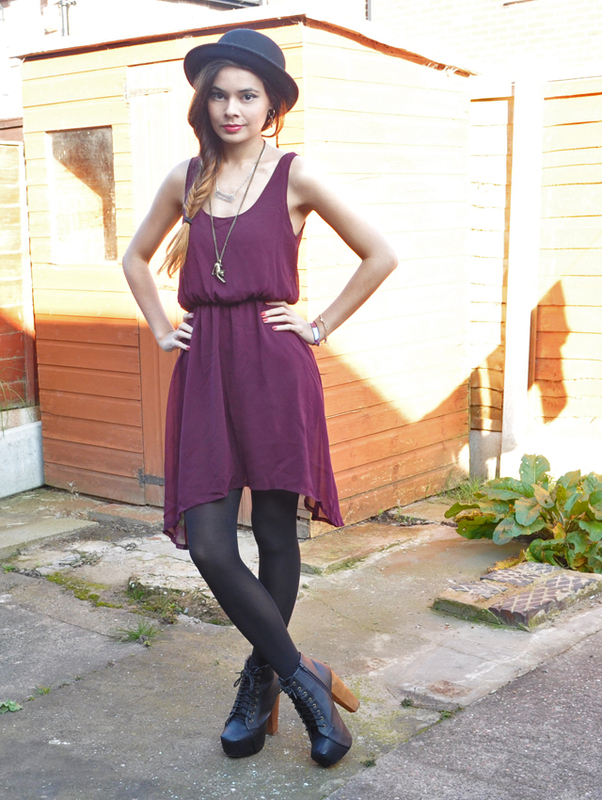 ), so it is definitely one to be worn with tights or leggings and avoided on windy days! Do you own anything from Fashion Culprit? I received another bag last week to add to my small but growing bag collection. This time it is from a company called IL2L, who have had their products featured on Britain and Irelands Next Top Model. They sell clothes and accessories and they let me pick an item from their Women's Bags section to review. The bag I got is the Storm Parker Across Body Bag*. Like the Marc B bag I posted about a couple of weeks ago, it is one of those bags that is the perfect size for carrying your essentials. However, unlike my Marc B bag, I think this one is more day-time friendly. The pink and lemon colour make it perfect for adding a pop of colour to a plain outfit, and I think this bag will be making a lot of appearances next Summer! 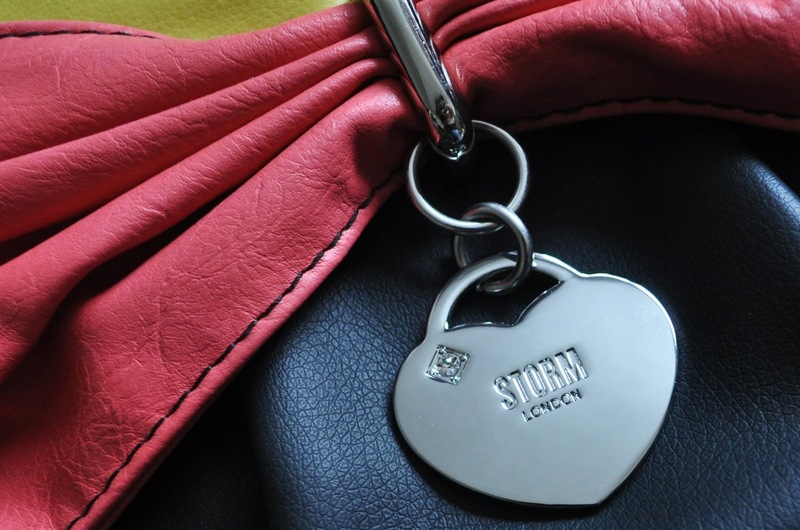 The pink strap is adjustable so that you can wear it on your shoulder or across the body, just like the name! A slight downside to this bag is that it isn't as big as you would probably expect from looking at the photo on the website- as you can see on my photos, the bag has a dip in the middle where the zip is so it is actually only half the size inside! 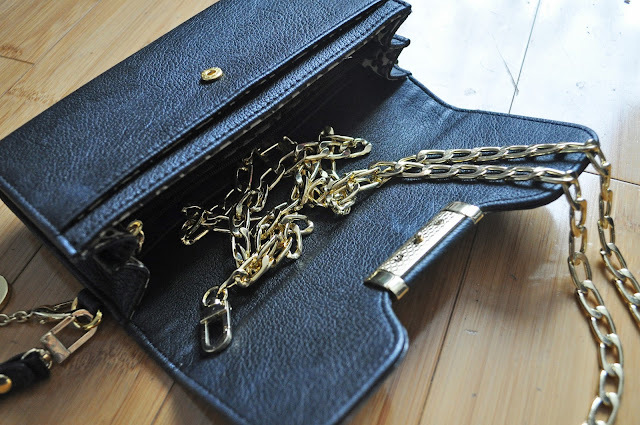 However, it still has enough room to fit my phone, keys, money and a few other bits and bobs in it. If you would like to take a look at the other products that IL2L has to offer, you can visit their website here. Have you purchased anything from IL2L? *DISCLOSURE: This is a PR sample. My opinions are still 100% honest and my own. Firstly, I am sorry about the bluriness and over-exposure occuring in these photos; the lighting and my camera clearly weren't on my side when I was taking them :( However, the most important part, the dress, still shows up pretty true-to-life, so I thought I would go ahead and use them to save me some time! Do you own anything from Lovestruck? Images taken from Glamorous website. -Enter the competition using the Rafflecopter form below. -The giveaway will end in one week's time on 28/10/2012. -This is a giveaway for my readers; if you enter through an account made purely for entering giveaways, your entry will not be counted. - This giveaway is open to the UK only. - The winner will get to choose their prize from a sample list of around 30 items. *DISCLOSURE: Sponsored giveaway, Glamorous are kindly supplying the prize for this giveaway. 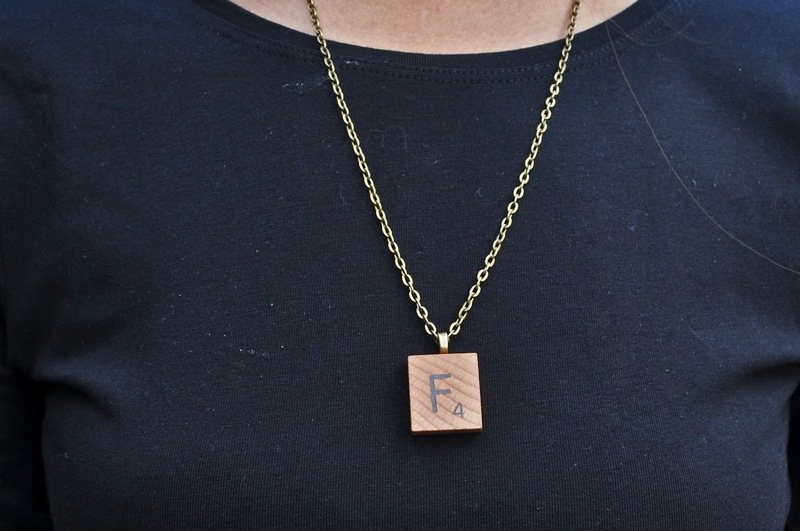 ** Winner will be able to choose an item of their choice from a sample list. Outfit: I Do Like To Be Beside The Seaside. 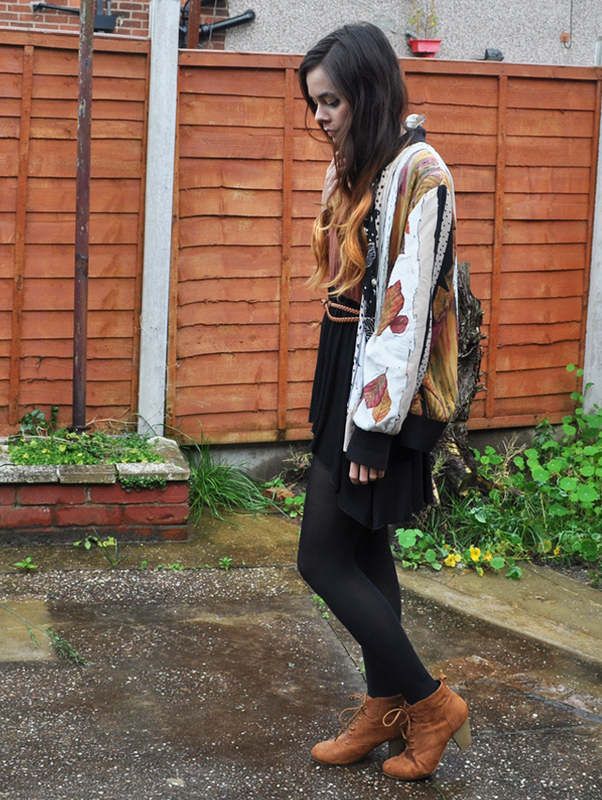 Wow, it feels like ages since I last did an outfit post! On top of my little blogging break, I think we have finally reached that time of the year that us bloggers dread, when it is a constant battle for decent lighting with the shorter days and gloomy weather! It is usually my mum who takes my outfit photos for me but she works through pretty much all of the day light hours, so until I can find a new photographer, outfit posts may be a little sporadic! Anyway, I absolutely adore this dress from Clothes Box; it reminds me of a 50s-style swimsuit/beach dress for some reason, hence the odd title for this post. Clothes Box is an up and coming family-run business which stocks vintage and modern pieces as well as brands that are harder to get hold of here in the UK, including Dear Creatures, the brand behind this lovely dress. I hadn't heard of them before they contacted me but they stock some lovely and unique pieces so I recommend checking them out! Have you heard of Clothes Box before? Anyway, I thought I would make my comeback with an exciting event that I have literally just come back from. 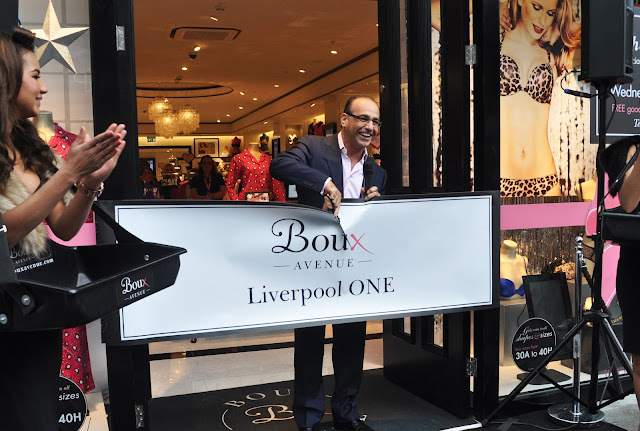 Theo Paphitis- the famous dragon- was in Liverpool this afternoon to launch a new Boux Avenue store- the fourteenth in the country! I went along to the press preview in the morning to have a mooch around the new store. 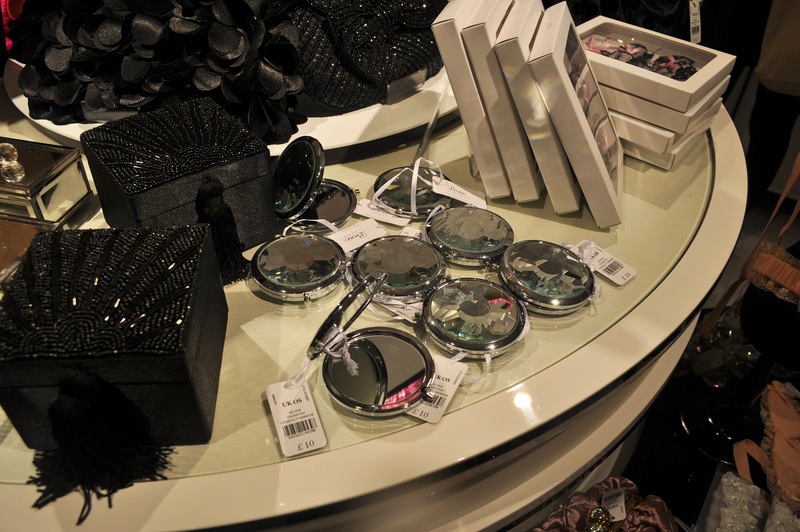 Boux Avenue is a lingerie, swimwear and nightwear store that stocks sizes 30A to 40H, and also sizes 6-20, meaning it caters to pretty much anybody. The best part is that they make beautiful, high quality pieces with affordable high street price tags. The layout of the shop is very luxurious, with vintage-style drawers holding all the stock and chandeliers hanging from the ceiling- You really do feel like you are shopping in a designer boutique. The staff are very welcoming and you never feel pressured to buy anything, but if you do they will offer you free gift wrapping to complete your experience! 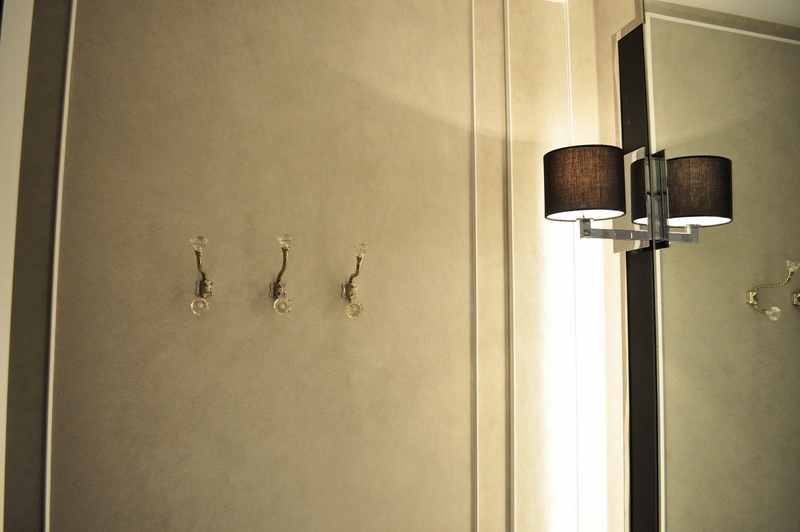 A unique feature than Boux Avenue boasts is in their fitting rooms. I'm sure we all know and understand the awkwardness of underwear shopping; trying something on and then having to get dressed again to change your size or having to shout out to somebody and letting the whole shop know that what you tried on isn't very flattering on you. 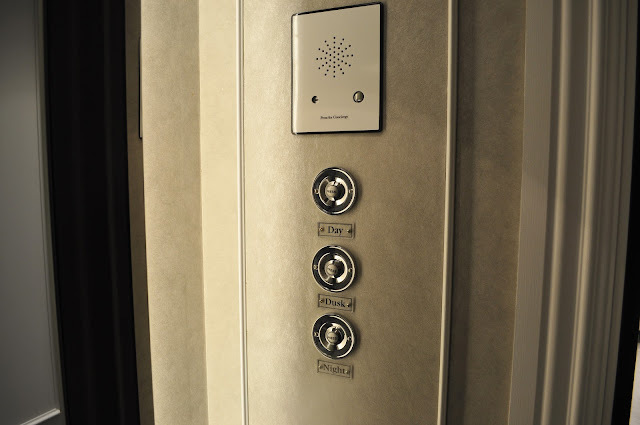 Each changing room in Boux Avenue has a little intercom system inside it, which if you buzz it, you can talk to a member of staff who will happily help you with what you need. The changing rooms also have three light settings to make the room look like daylight, dusk or night time, so you can see what your undies will look like in different lights. Fancy! Overall, I had a lovely day experiencing what the store had to offer before it opened to the public, and it's always nice to see stores opening with new ideas and catering for wide spectrums of people. I was given a lovely goodie bag at the end of the preview which included a gift voucher so I can't wait to go back and spend it! 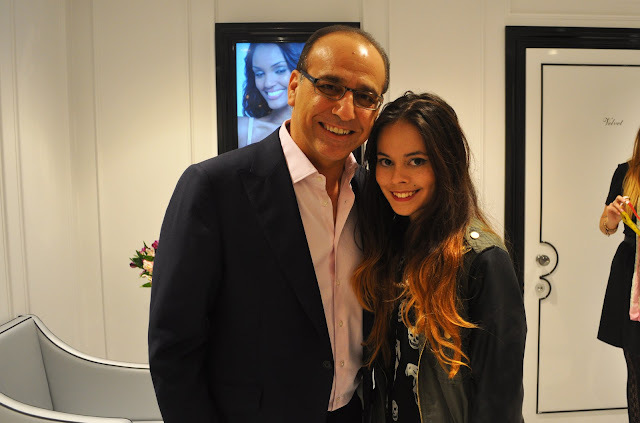 Theo Paphitis was lovely too- Not at all as scary as he comes across on Dragons' Den! Have you been to a Boux Avenue store? I've never been much of a "bag person"; I don't have a huge selection of them, just a couple to choose from on a day-to-day basis and then a couple more for nights out and I use them to death before I buy a new one. This Marc B bag is the newest addition to my very small collection and it's my new go-to bag for nights out or a quick trip to the shop. 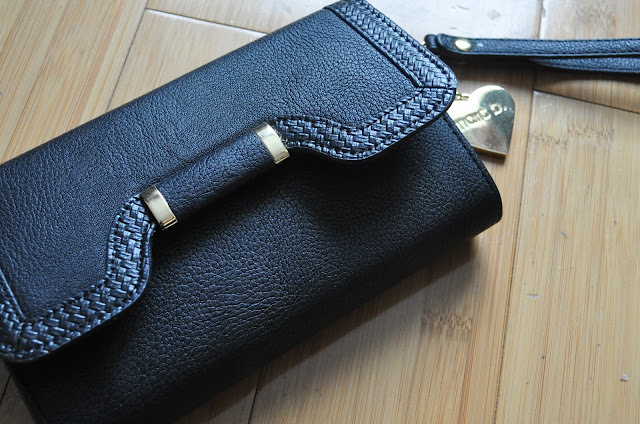 This bag is very compact (H 14cm x W 21cm) and is perfect for carrying around your phone, your money and your lipstick. 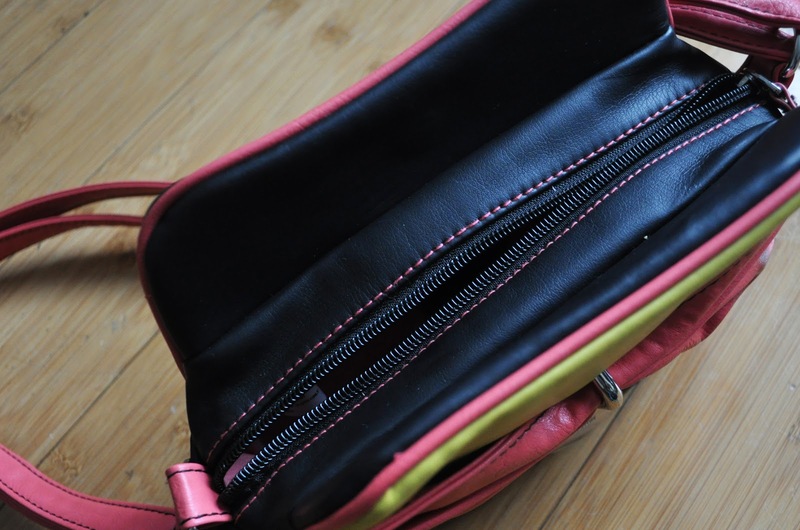 Inside is a zipped compartment for your coins and six slots for your cards which I love as I used to just throw my bank card and ID in to my old clutch bag and was always terrified of them falling out! 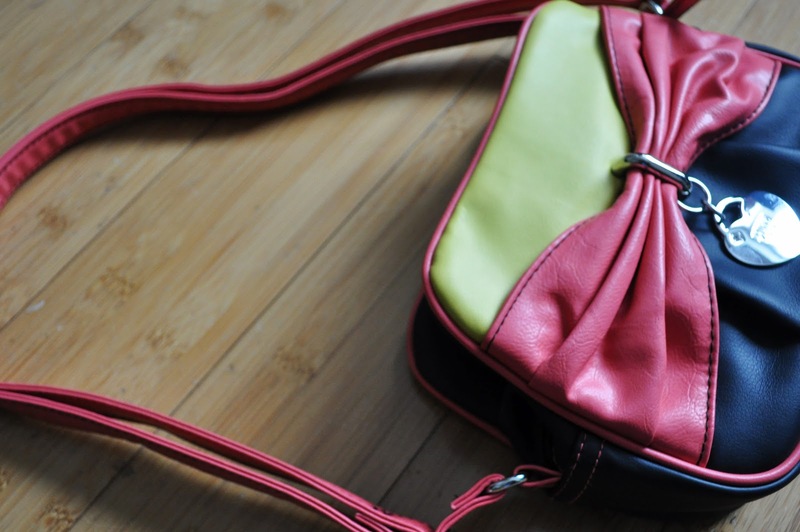 The bag comes with an arm strap if you want to use it as a purse or a clutch, and a longer chain strap that just clips on so that you can wear it across-the-body or on your shoulder. The "Marc B" charm is also detachable. I love the gold hardware on Marc B bags, it's super shiny and makes the bags look more expensive than they are! 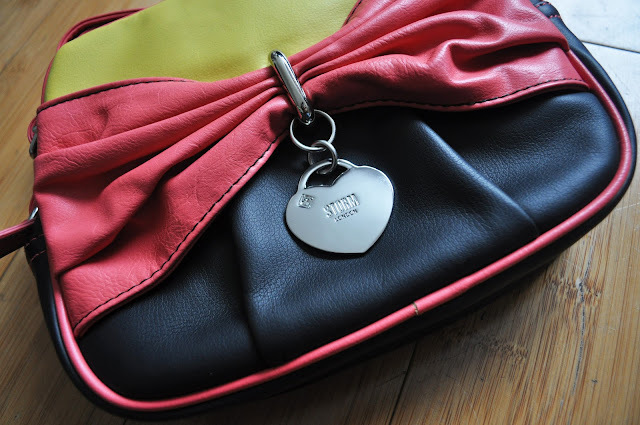 This bag costs £37.00 which may seem excessive for such a small bag, but now that I have it I think it is worth it as it's such a handy and versatile bag as well as looking and feeling high quality. If you would like to check out Marc B's range, you can purchase them from the website here. 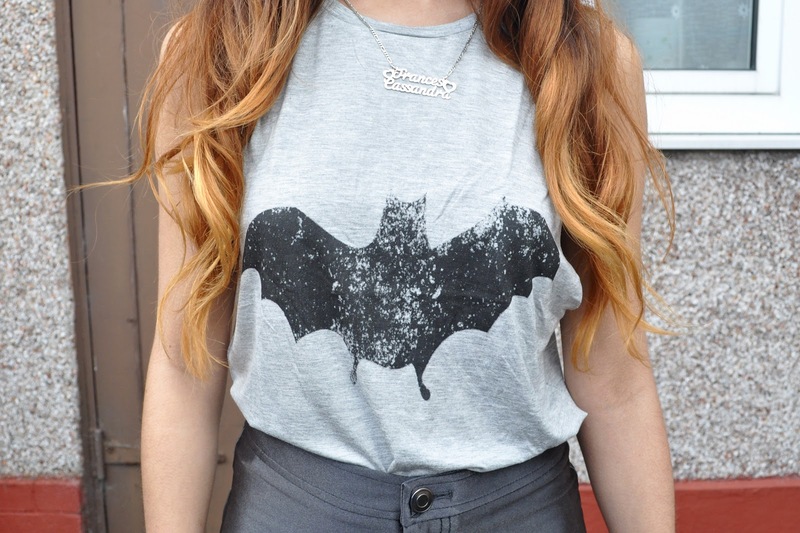 They are also stocked in many Topshop stores. 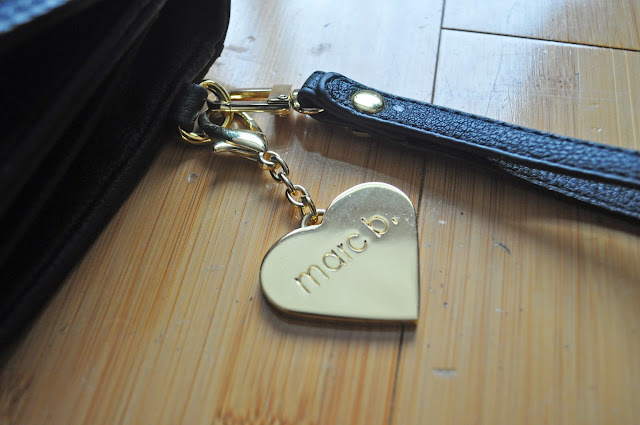 Do you own anything from Marc B? 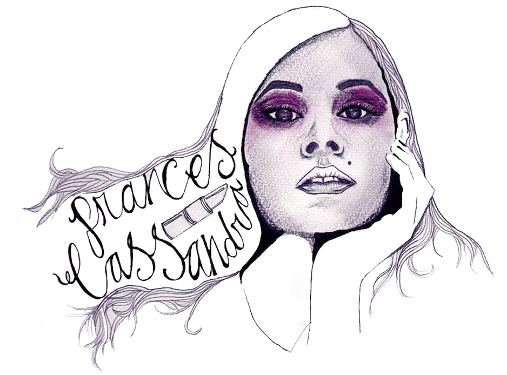 I just wanted to share with you all this beautiful illustration of me that was done by lovely Malia from Deep Fried Freckles. Scrolling through all the paintings on her blog makes me wish I hadn't put my paint brushes away after High School and had turned my own art skills in to something like this. 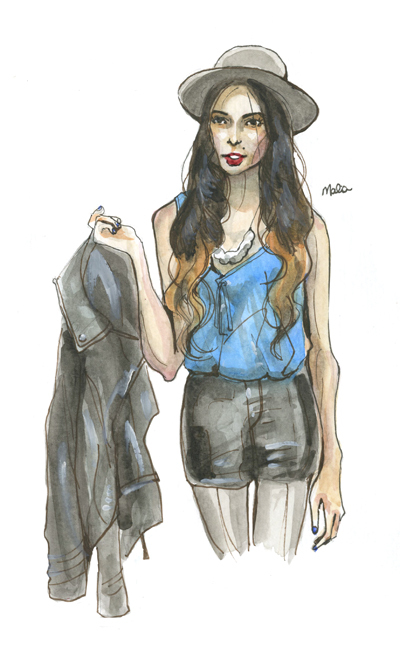 Malia's illustrations are ink and watercolour paintings with graphic touch-ups. I remember being useless at using watercolours so I think it is amazing how she doesn't leave out a single detail! If you would like to check out more of Malia's work, head over to her blog here. Today, I thought I would snap a few photos of what I wore for uni this morning as I was quite pleased with how my outfit came out after minimal effort on my part haha! Getting out of bed is definitely a struggle for me and the more times I can press snooze on my alarm and the quicker I can get ready, the better! I bought this skirt for a bargainous £7 in the H&M sale a month or two ago, but had no idea what to wear it with (does anybody else think that skirts are so much harder to style than, say, shorts or trousers?! ), but I decided to play it safe today with this plain black long-sleeved top from Primark. I love how the blue colour block on the skirt makes a simple outfit look a little less plain. 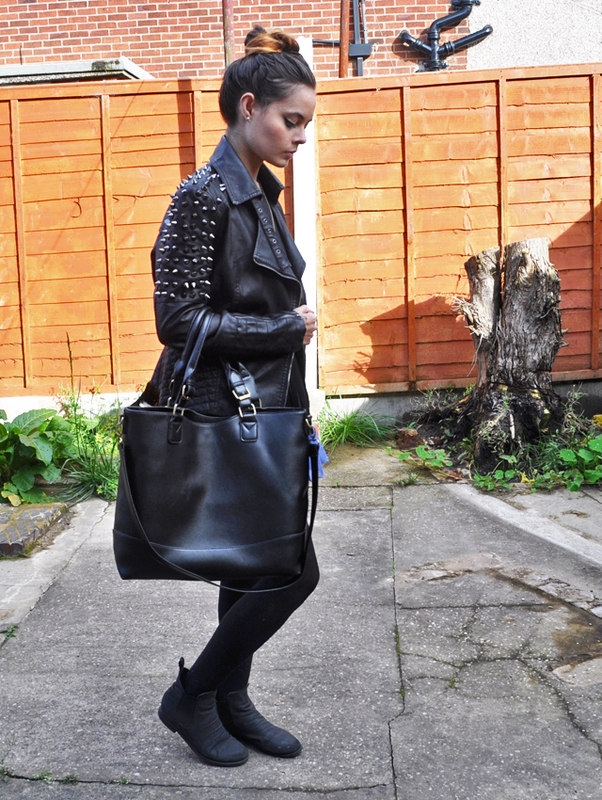 Also, say hello to my new favourite leather jacket! 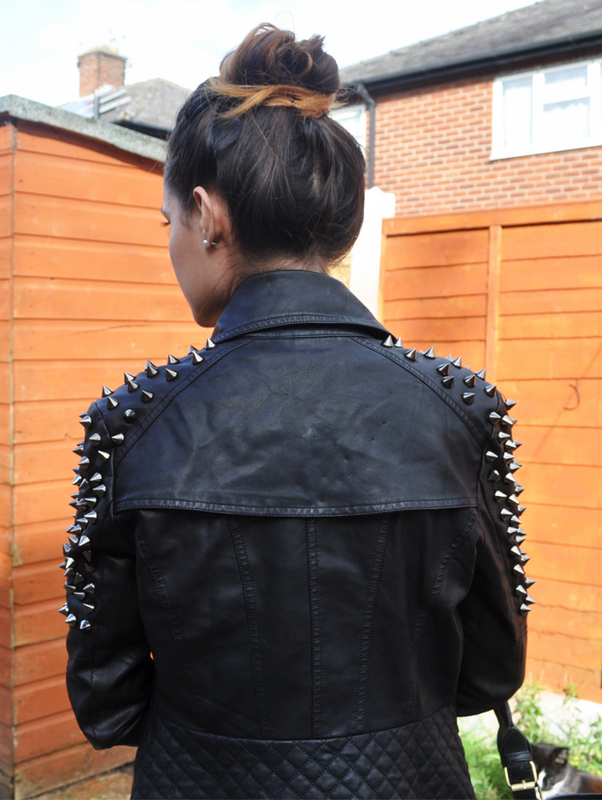 I won this in the blogger contest they held last month and I think it is absolutely amazing- It fits me perfectly and the studs add a little edge to any outfit. Are you a morning person or do you love an extra five minutes in bed? 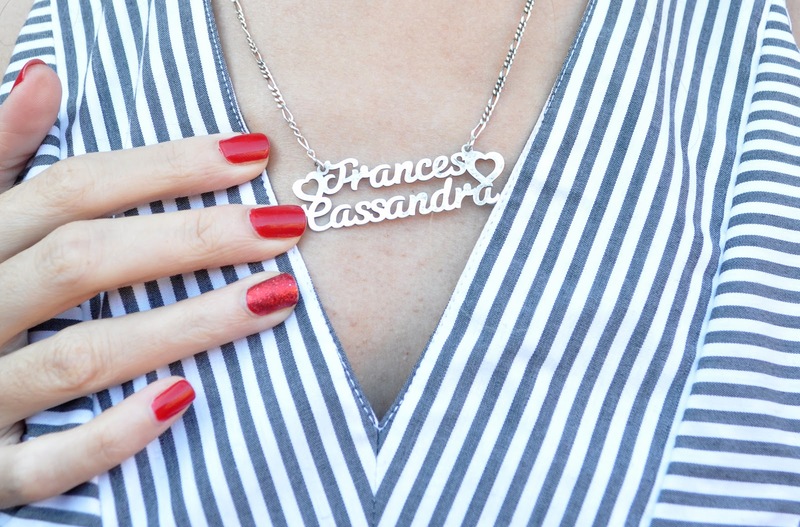 *DISCLOSURE: Starred items are PR samples or giveaway prizes.